Ideal for any person that loves horse shoes or needs a little something for good luck. PICTURED AND PRICED HERE IN 14KT WHITE GOLD! Offering a nice horse shoe quality design and simple elagance. 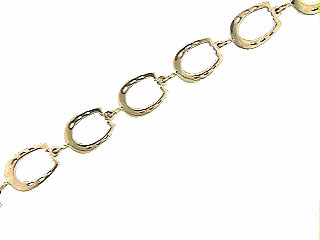 This bracelet is dantey, ideal for the person that doesn't like big. Dimensions: 3/8 inches wide Standard size shown 7"
For a unique style, try every other shoe in a satin finish.